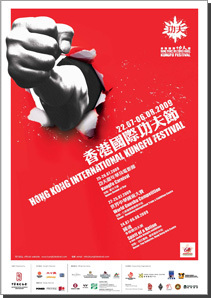 2009 Hong Kong International Kung Fu Festival will be the first integrated cultural event to celebrate Hong Kong's martial arts traditions. This event will pay tribute to distinguished local martial artists who have made the city the global hub of kung fu, as well as to diverse cultural industries that have played a pivotal role in introducing Chinese martial arts to the rest of the world, via the media of film, television, martial arts novels, magazines and comics. 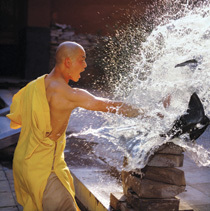 More than a means to fitness and health, kung fu lies at the core of Hong Kong identity and culture. For over half a century from the days of black and white television to contemporary cinema, Hong Kong has remained at the forefront of international action films, having produced a host of memorable on-screen icons, as immortalized by the folk hero Wong Fei Hong, and pioneered a unique and lasting genre of 'kung fu' film. Since then, Hong Kong has reinvented its action hero according to the needs and sentiments of the times, and continues to be a trendsetter in the world of kung fu cinema. Hong Kong is also home to many renowned kung fu masters who have spread knowledge of Chinese martial arts to every corner of the world. To name but a few we have Bruce Lee, Lam Sai Wing, Lam Jo, Yip Man, etc. To this day, Hong Kong remains a pilgrimage site for dedicated kung fu students around the world. All in all, Hong Kong has an unparalleled influence on global perception, understanding, representation, and development of kung fu.